•Cut each Mushroomto four pieces and keep it on a side. •Now in a skillet add four tsps of oil, cinnamon stick, green chillie and onion. Cook until onion becomes soft, then add the ginger garlic paste and the dry spices (marked 10 through 13). 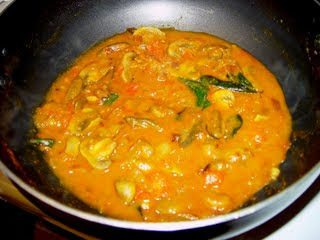 •Add the Mushroom, green peas and simmer the curry for ten minutes in med-low heat. Now make a paste with paste ingredients. Marinate the fish pieces with the ground paste. Marinate for 1 or 2 hours. Keep preferably in the refrigerator. Take a heavy bottomed pan and heat with 3 tbsp of oil. Now add the marinated fish pieces and cook on low flame for 8 to 10 mins. Be careful the fish doesn’t burn. 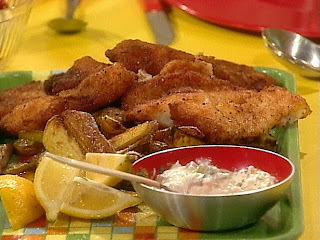 Flip over the fried fish and cook on low flame for 5 to 7 mins. Remove the fried pieces from the pan. Heat oil in a pan. Add chana dal, urud dal, cumin seeds, mustard seeds. Wait to splutter. Add red chillies and few curry leaves . Add choped onion, chillies and mix for two minutes. Add choped cucumber, tomotos. Cook covered and mix occasionally for 10mts. Add turmaric powder, salt, chillipowder and cook covered with low flame until water dry out. may add drumsticks with cucumber. Remove skull, tail and pelt of prawn and keep body only. Clean sufficient times to ensure the sand/dust is not remained. Heat a vessel and add 2 cups of water, 4-5 Tbsp vinegar, prawns, ½ Tbsp Chilli powder and a bit salt. Cook well up to edible. Put the cooked prawns on a strainer to drip off the water content. Heat a frying Pan and add little coconut oil, add some curry leaves and fry the prawns up to brown and a bit crispy. Let the oil drip off and keep aside.Make paste of Ginger,Garlic and Green chillies. Heat a Pan and fry up the paste using Gingelly oil on low flame up to brown and keep aside.Fry rest of the Chillie Powder and Turmeric Powder using Gingelly oil.Fry the fenugreek, mustard seeds and cumin seeds and slightly crush, but not to powder.Fry the curry leaves with oil to brown and keep aside.Mix all the above with fried prawns and put on heat. Pour the vinegar and add required salt. Gently stir the mix on low flame for 5 minutes to let the gravy thick. Put in to bottles after it turns cold. Heat a bit Gingelly oil and keep to cold. Pour this oil a little in to bottles as a layer on the top to avoid fungal infections. Keep for 2-3 days and can use. •Soak the rice with enough water for about 3-4 hrs. •Drain the water using a mesh and leave the rice in the mesh for about 3 hrs so that it gets dried. •Now grind the rice in a grinder till it becomes fine powder. •Roast the sesame(nuvvulu) lightly on a low flame. •Now add the Sesame,Ajwain and salt to the rice flour.Make a dough with the help of water as you do for chapathis. •Take small quantity of the dough in hand and make circles with thin lines on a cloth as in the below picture. •Repeat this process to make all the sakinalu.Don't worry this will take some time but on pratice you can do it. •After they are done allow the sakinalu to dry. •Now take a hallow pan with oil to fry. •Take the sakinalu slowly with help of a flat plate and fry them in the oil till light brown colour. •Finally your sakinalu are ready. •These snacks can be preserved upto 1 month in a air tight container. •Soak the tamarind in water for about 20 minutes and extract juice from it. •Roast the methi seeds and the jeera lightly on a low flame and grind them. •Now take a pan with 3 to 4 tbsp of oil and add the mustard seeds. 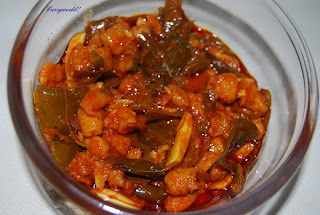 •After they splutter add the the green chilllies,curry leaves,ginger garlic paste,turmeric and onions and fry them . •Then add the tamarind juice and allow it to boil . •Now add the red chilli powder,the powder(methi seeds+jeera),coriander powder and salt. •Finally add the boiled eggs and allow the pulusu on a medium flame for about 5 -10 minutes. 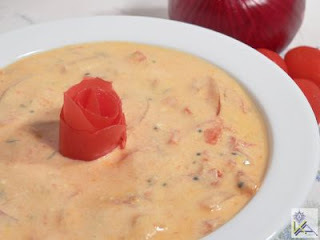 •Serve the dish after 30 min so that the eggs get a good taste.This tastes great with rice. 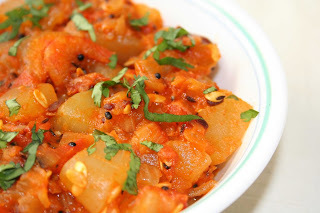 •Firstly boil the Chama dumpalu in cooker with sufficient water for about 10-15 minutes. •Then peel the skin as we do for potatoes and chop them into small thin pieces so that they get fried well. •Now take some oil in a pan for seasoning and add mustard seeds. •Then add the chopped onions,green chillies,ginger garlic paste,turmeric powder and the curry leaves. •Now add the chama dumpalu and mix well. •Finally add the red chilli powder,salt,coriander powder. •Cook on mediun heat untill it gets fried well. 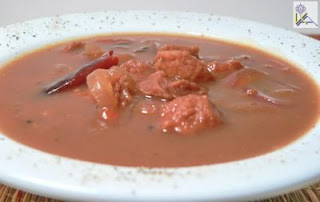 •Your curry is ready now and tastes great with rice. 1) Soak the green gram dal along with rice in water over night. 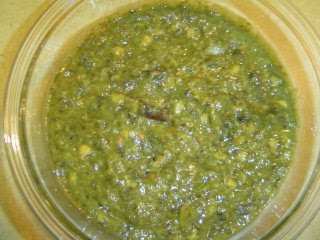 Grind the green gram, rice, green chilies and ginger root into a smooth paste adding very little water only if needed. Now add salt. 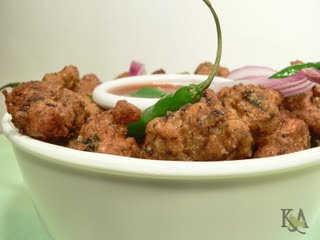 2) Mix the chopped onion and chopped snake gourd into the batter prepared in step 1. 3) Heat oil in a dutch oven/kadai. When the oil is hot enough take bite sized portions of the batter and fry them in oil(if you don't want to touch the batter with your hands, you can use cookie dough scooper). They tasted really good with home made ginger pickle. Even Krishna loved them, ofcourse he was the reason I prepared these as I can't get him to eat snake gourd otherwise. 1) Break the coconut into pieces and separate coconut pieces from the shell(this part can be tricky but according to Krishna the coconut shell has a point and if you can find that and start there then the coconut piece will separate from the shell at once . I am undergoing training for that, will let you know guys how it goes). 2) Chop the coconut into small pieces, so that you can grind them easily. 3) Grind the soaked rice into a smooth paste by adding approximately a 1/4 cup of water(this will probably take some time depending on the type of blender you are using). 4) Now grind the coconut into paste by adding a 1/4 cup of water(as sooth as possible). The actual recipe calls for extracting the coconut milk after grinding it into smooth paste but I decided to add the whole coconut paste in rather than just using its milk. 5) In a saucepan boil the sugar and 1/2 cup of water to prepare sugar syrup. Boil the syrup till it reaches a single string consistency. Crush the cardamom pods and add them to the sugar syrup. 6) Add the rice batter and coconut paste into the sugar syrup(actual recipe calls for adding some food color at this stage but I omitted that as well). You need to stir this mixture continuously from now on. While stirring slowly add the ghee in a multi step process. Stir it until the halwa thickens and the ghee starts coming out of it. Remove the saucepan from heat. 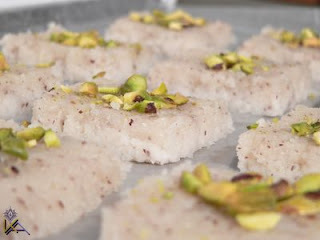 7) Spread this halwa on a flat surface and when its cool enough cut into pieces. Decorate it with chopped pistachios if you want. Slice the bitter gourd into very small pieces. Add salt and turmeric powder to the bitter gourd and let it sit for a few minutes. Squeeze them and remove the juice that you obtain by squeezing them. Heat 1 tsp oil in a pan and add bittergourd pieces to the pan along with salt. Fry them until they turn a little brown.Heat 1 tsp oil in a different pan and add cumin, mustard seeds to the pan. When the seeds start sputtering add crushed garlic, whole red chillies, curry leaves. Add onion and fry them til they turn a little brown; now add the fried bitter gourd pieces to this. Let them cook till they are done and add chilli powder, crushed jaggery(you can substitute this with brown sugar if you don't have jaggery on hand). One thing I have learnt from my mom is not to add chilli powder until the fry is completely done otherwise you will be suffocated by the sharp smell produced by the chilli powder which will leave you sneezing in no time. Heat oil in the pan, add mustard and cumin seeds when the oil is hot enough. When the seeds start sputtering add asafoetida and curry leaves in. Add the chopped onion to the pan and fry them till the pieces turn translucent. Now add the chopped tomato pieces in and let them soften a little bit. Squeeze the soaked tamarind and add the tamarind juice to the onion & tomato mixture. Add the salt, chili powder and turmeric; let the pulusu(soup) cook for 15 to 20 mins on medium high. 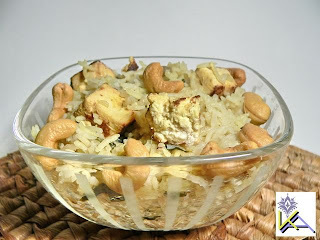 If you want to add jaggery to the pulusu add it after cooking the pulusu halfway through. Now add the fried vadiyams into the pulusu and cook for 10 more minutes. Chop onion and tomatoes into thin long strips. Heat oil in a pan. 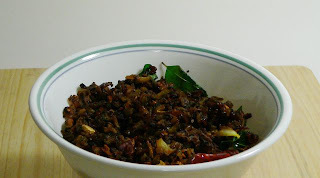 Add the cumin and mustard seeds, when the seeds start sputtering add in the dried red chili and curry leaves. Add the chopped onion and tomatoes to the pan along with turmeric and salt. Fry them until the water generated is completely evaporated. Let it cool off a bit. Add it to the yogurt. Serve it with white rice/roti. This can also be used as a dip.